As a sports freak, the first thing that comes to our mind is a charismatic sports person and we start idolizing him. However, very little attention is given to the man who made the sports man. John Harbaugh is currently the head coach of the Baltimore Ravens, a team which has seen outstanding success under his coaching. A man who follows intense work ethics is known by far the best coach in NFL history. 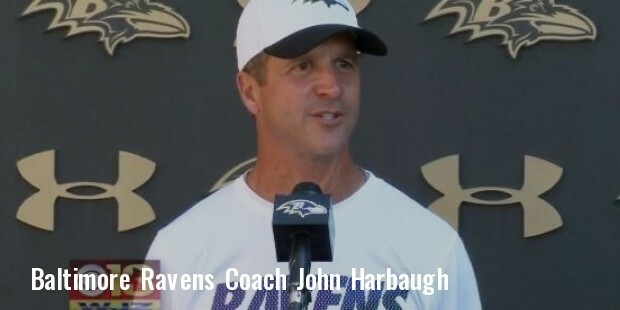 John Harbaugh was born on September 23, 1962 in Toledo, in Ohio State in USA. His mother, Jacqueline is of half Sicilian, half Polish descent while his father Jack Avon Harbaugh traces his ancestry to Germany and Ireland. John was blessed with childhood nurtured in a multi cultural environment. He was educated in the Pioneer High School in Michigan. Due to his father’s four decades of service as a football coach, John was introduced to football at a very young age. He played in the defensive position for University of Miami from where he was pursuing his higher studies. John’s early career as a football player got a setback because of an injury he got playing for his school and college teams. These injuries were a sure signal that limited his athletic abilities to grooming others on field. John graduated from Miami University and joined his father’s staffs in the position of graduate assistant in the Western Michigan University. This opportunity turned out to be the turning point in his life. For three years, John moved with his father discussing about strategies and game plans which were due to come in full colors in the coming years. 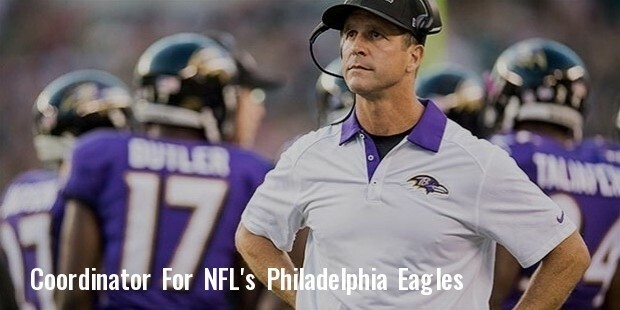 In a change of events, John was offered the coordinator post of NFL’s Philadelphia Eagles. He worked with the team for around nine years. In 2007, he was made the secondary coach of the team. 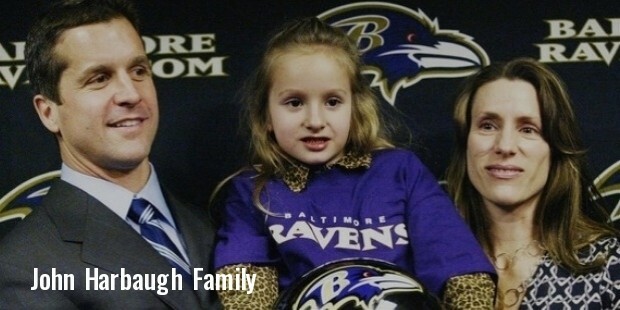 The breakthrough came in 2008, when John was interviewed for the position of head coach for the Baltimore Ravens. 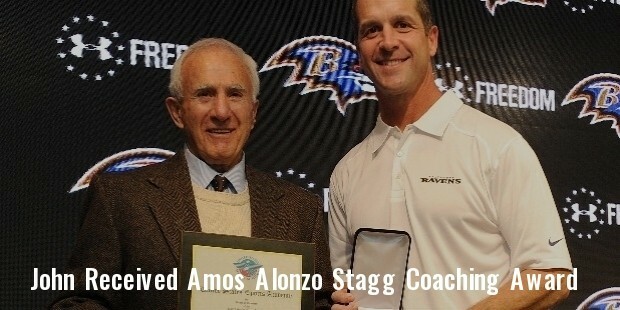 The experiences with his father during the initial years helped him to impress the Baltimore owner Steve Bisciotti. This change of events in his career, made him into what he is today. Baltimore Ravens started their season with three losses in five games. The inclusion of John Harbaugh as the head coach helped the team to win nine out of remaining eleven matches. This is indeed an illuminating point in his career. John simultaneously became the first NFL coach to have recorded five successive playoff appearances. Taking a risky profession as a career, that too after some initial setbacks, surely highlights John’s attitude of taking himself to success. John is a religious person in his personal life. He is a devout Roman Catholic. John married Ingrid Harbaugh and the couple has a daughter. John’s brother, Jim is currently the head coach of the Michigan Wolverines. John is an introvert person when it comes to his family and prefers to keep his personal life out of media glares.